This past Monday in technical keynote at JavaOne 2011 we made a series of announcements, which I referred to in the recent posting. The video for the keynote can be seen (along with a lot of other videos) on the Oracle Media Network pages. 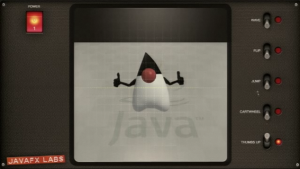 The video starts off with Mark Reinhold talking about Java 7 and Java 8 with a cameo by Charles Nutter & JRuby. There are some great things there if you didn’t have a chance to see his part of the keynote. The JavaFX keynote portion starts at the 38 minute mark and runs about 22 minutes. Watching the video it is clear that the speaker should refrain from clapping when mic’d up. Doh, will need to remember that for next time (got a bit carried away :-)). Reading the press about JavaFX over the past couple days I’ve noticed a few inaccuracies. One thing to pay attention to during Jasper’s Labs demo at the end is that some of the demos have a “JavaFX 2.0” sticker on them, and others have “JavaFX Labs” sticker. Those with the blue 2.0 sticker are 100% runnable on the currently released stack. The red ones with “labs” are future work that we’re looking at for an update release or 3.0.